"Sri Krsnadasa Kaviraja, the author of Caitanya-caritamrta, says that all good qualities become manifest in the body of a Vaisnava and that only by the presence of these good qualities can one distinguish a Vaisnava from a non-Vaisnava. 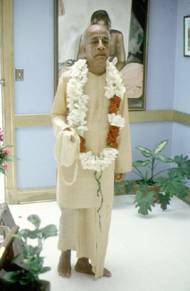 Krsnadasa Kaviraja lists the twenty-six good qualities of a Vaisnava: (1) He is very kind to everyone. (2) He does not make anyone his enemy. (3) He is truthful (4) He is equal to everyone. (5) No one can find any fault in him. (6) He is magnanimous. (7) He is mild. (8) He is always clean. (9) He is without possessions. (10) He works for everyone's benefit. (11) He is very peaceful. (12) He is always surrendered to Krsna. (13) He has no material desires. (14) He is very meek. (15) He is steady. (16) He controls his senses. (17) He does not eat more than required. (18) He is not influenced by the Lord's illusory energy. (19) He offers respect to everyone. (20) He does not desire any respect for himself. (21) He is very grave. (22) He is merciful. (23) He is friendly. (24) He is poetic. (25) He is expert. (26) He is silent."